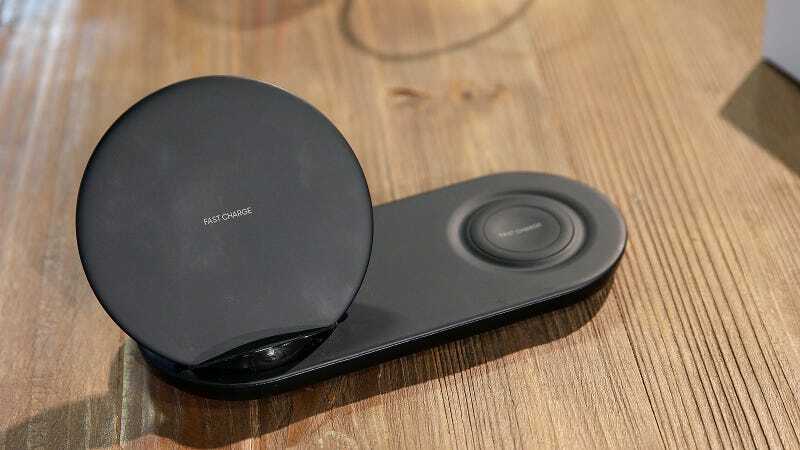 Rumors about Samsung’s upcoming Wireless Charger Duo have been making the rounds, especially in advance of the Note 9's launch on August 9, but Amazon seems to have outright confirmed its existence by putting it on display at its event. Unfortunately, the handful of Amazon employees that were manning the nearby smart home and electronics station didn’t know much about the device, including its price or expected release date. And when I checked out the product tag that was sitting nearby, it was labeled “Samsung Qi Pad (2018).” which seems like a different product altogether. In fact, when I tried to look up the product using Amazon’s QR code, it links you to this thing instead, which is a wireless charger from Samsung, but not the one that was on the display. So how did this unannounced wireless charger get outed ahead of its official release? My best guess is that someone at Amazon simply grabbed the wrong product and put it on display instead of the Qi Pad that was apparently supposed to be there. We’ve reached out to Amazon for more information on the device and to ask why it was on display. Reached by Gizmodo, Samsung declined to comment.